CACI facials are a non-invasive aesthetic treatment that have been known to deliver dramatic results without the need for surgical interventions. Dubbed the ‘non-surgical facelift’, celebrities such as Jennifer Lopez, Kim Kardashian and Linda Evangelista are huge fans – whilst some have even bought their own machine for use at home. 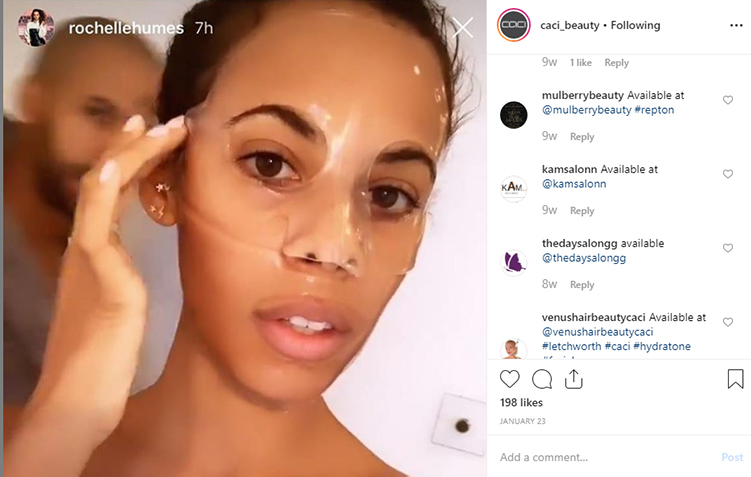 Every now and again a beauty hack will appear and become the new ‘It’ trend – which often disappears as quickly as it became popular. CACI facials however have been around for over 20 years and now the red-carpet secret is more accessible than ever. With its popularity on the rise, we thought we’d find out a little more about the treatment so you can judge for yourselves. CACI stands for Computer Aided Cosmetology Instrument… don’t worry, it’s not as scary as it sounds! It’s a micro current machine that uses specific waveforms and ultra-low frequencies to transmit tiny electrical signals to boost muscle tone and skin tissue. It works in harmony with the body’s own bio-electrical field to help improve skin tone, texture and face shape. What is a CACI facial? The facial itself is an LED light therapy where warm, coloured light penetrates deep into the skin. Micro current facial toning is then combined with the light therapy to regenerate tissue and help repair collagen. The CACI facial can be described as a MOT for your face thanks to lymphatic drainage, peeling, cleansing and toning and it also works to banish deep lines, giving you the appearance of younger looking skin. Clever, right? All our CACI treatments use the CACI Ultimate Machine, as the name suggests this machine really is the ultimate aesthetic treatment system. It is the most versatile system available combining Microcurrent, Facial Toning, Crystal Free Orbital Microdermabrasion and LED light therapy. Is a CACI facial pain free? How many CACI facials are available? Non-Surgical Face Lift – CACI’s signature treatment refreshes the skin to enhance glow and leave you feeling and looking more youthful. The Non-Surgical Face Lift is a highly respected treatment with twenty years medical research behind it. An advanced non-invasive facial where microcurrent impulses will reduce the appearance of fine lines and wrinkles improving the skins elasticity by toning the facial muscles and neck area. Wrinkle Revolution – Amino-Lift Peptide Complex is applied to the specific areas of concern. CACI’S Wrinkle comb handset is then used to precisely exfoliate lines and wrinkles around the eyes, forehead and mouth areas. Results are immediately visible and have been shown to reduce wrinkle depth by 26% after 28 days of use. Hydratone – Ideal for a special occasion or brides to be this treatment will deeply nourish and soothe the skin. Combining active microcurrent rollers with a unique, electrically conductive silicone gel mask that has been infused with powerful hydrating properties. The rollers gently massage the face causing the mask to become electrically charged so that the whole face is bathed with rejuvenating energy. Blemish Fix – This treatment targets specific blemishes, spots or pigmentation by resurfacing the skin by resurfacing the skin. Combining anti-bacterial and anti-inflammatory red and blue LED light therapy, to help heal the skin and trigger tissue repair. Ultimate Anti-Ageing Facial – For those with dull, dehydrated or ageing skin this treatment is designed to revitalise youth. The 90-minute treatment offers a combination of microdermabrasion, microcurrent and red and blue light therapy. Includes a gentle pinching action to bring blood to the surface of the skin and promote fullness. Finished with the CACI mask which is cooling and soothing. An amazing pain free alternative to Botox and surgery. Double Chin Lift – Double chins are very similar to cellulite often appearing when you reach your middle-aged years. This treatment uses Quad Probes specifically developed to target the muscles around the jaw line. These Probes emit tiny electrical impulses to lift, firm and redefine facial contours. Body Treatment – Faradic technology uses a higher intensity output than microcurrent stimulation and aids the lymphatic system by stirring up any unwanted fats and training toxins to keep away from areas prone to blockages. What do I need to know before and after a CACI facial? Prior to your CACI facial you will receive a consultation so that your therapist can help establish the results you want and the possible outcomes with your chosen treatment. The treatment itself lasts around 90 minutes, depending on your chosen facial and will feel warm and energising. fter you have received your CACI facial our therapists will advise you on aftercare products to use at home. These will help prolong and enhance the effects of your facial. Salon Manager Catherine recommends using the CACI Hydro Mask which you can purchase from our Birmingham salon. A popular choice for many celebrities including Anthony Joshua and Rochelle Humes. It contains moisturising attributes that replenish sun damaged and dehydrated skin. Working in line with your CACI treatment this masks antioxidant ingredients helps to smooth and soften the appearance of fine lines and wrinkles. Want to book your CACI facial? 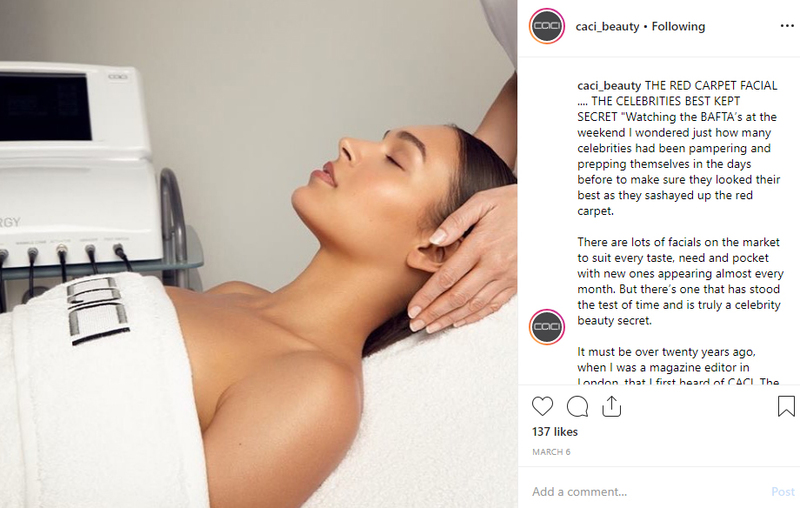 Our CACI facials are exclusive to our Birmingham, Belgravia, Debenhams London and Fenwick Newcastle salon, book in for your luxurious treatment by calling your local salon.